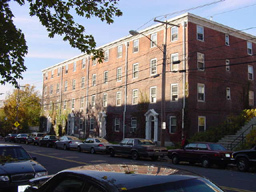 North Hall is conveniently located across from the main academic campus on Sage Avenue. The residential complex has both doubles and single units with common bathrooms, multiuse lounges, and kitchenettes. North Hall staff can be found here. North Hall has both double rooms and single rooms, sharing two floor bathrooms between approximately 22 people. There are two kitchenettes in the building, as well as a multi-use lounge and laundry facilities on the first floor. North Hall is located on Sage Avenue across from the academic core of campus. North Hall was built in 1932, and converted into laboratory and office space in 1961. In 1978, it was remodeled and converted back into a residence hall.